Each winter and spring, gray whales migrate near shore between Arctic feeding and Mexican breeding grounds. 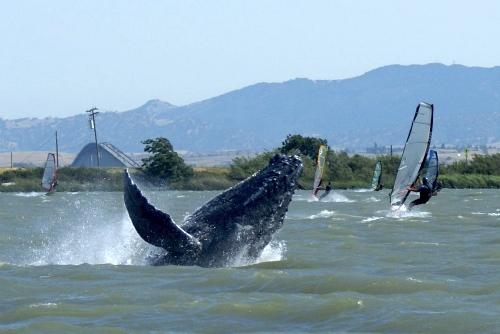 In spring, especially, gray whales wander into San Francisco Bay, San Diego’s Mission Bay, and into Tomales Bay – a shallow arm of Gulf of the Farallones National Marine Sanctuary. While here they face dangers from disturbance, shipstrike, disorientation, entanglement in fishing gear, stress from harassment, and skin disease. To prevent disturbance, the Farallones National Marine Sanctuary advises watching for a whale’s blow, or exhalation, which looks like a puff of smoke. Humpback and gray whale blows are bushy, and rise to about 10 feet. Be aware there may be whales nearby that you do not see! Get between a cow and her calf: if separated, the calf could starve. Entangled whales should be reported immediately to the National Oceanic and Atmospheric Administration (NOAA’s) Whale Entanglement Hotline: 1-877-SOS-WHALE. Never attempt to free a whale yourself. Injured marine mammals should be reported to the Marine Wildlife Rescue regional agencies. Check this information at https://www.parks.ca.gov/?page_id=29224(under EMERGENCY CONTACTS - MARINE WILDLIFE RESCUE). Should you have an encounter with marine mammals, make sure you “share the road” and maintain a respectful distance from our amazing marine wildlife.